The yin and yang of cycle campaigning manifests itself in many ways. A Jeckyll and Hyde existence, extolling the simple virtues of cycles on one hand, complaining bitterly about the reality of using one on many of today’s roads on the other. Watching delightful flicks of high modal share on foreign shores at night, while donning protective equipment to battle alone during the day. And when we’re not bouncing from one extreme to the other we’re arguing about how the gap between the two can be bridged. Next stop Leicester. 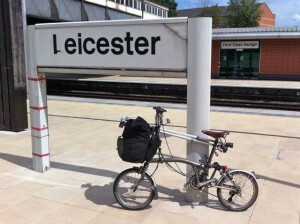 This entry was posted in Inclusive Cycling Forum and tagged bikes, conference, disability, infrastructure, leicester, mobility, words on Tue 14 Jun 2011 by kevin hickman.